To search MLS Home Listings for the Palos Verdes Peninsula, Click Here. residential communities in the world. The Palos Verdes Peninsula is also one of the wealthiest communities in the country, as described in the Los Angeles Business Journal.. Rolling Hills Estates and the Palos Verdes Peninsula have an extremely interesting history . The commercial center of the Peninsula is located in Rolling Hills Estates, including The Promenade of the Peninsula regional shopping center, and the Shops at Palos Verdes. The unincorporated Los Angeles County area known as Palos Verdes Peninsula is surrounded by Rolling Hills Estates and is the residential area on either side of Crenshaw Boulevard,south of Palos Verdes Drive North, which is accessible only from Palos Verde Drive North, as well as a small area just south of the intersection of Rolling Hills Road and Crenshaw Boulevard. 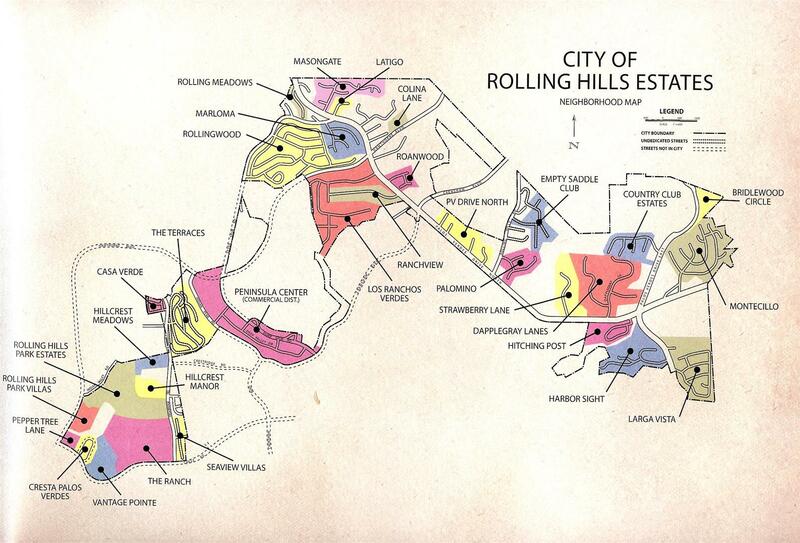 As can be seen above, the city borders of Rolling Hills Estates is a patchwork of neighborhoods intertwined within the borders of Rancho Palos Verdes, with the gated City of Rolling Hills adjacent to Rolling Hills Estates and surrounded by Rancho Palos Verdes. 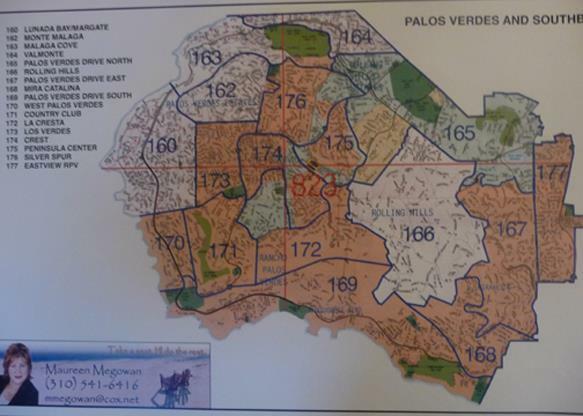 The areas in beige above are unincorporated areas of the County of Los Angeles with the mailing address of "Palos Verdes Peninsula" and are not part of any of the four cities on the Palos Verdes Peninsula. Palos Verdes Peninsula: ( Area 165 in beige in map above)The residential area on either side of Crenshaw Boulevard,south of Palos Verdes Drive North, which is accessible only from Palos Verde Drive North, is not in the City of Rolling Hills Estates, but is in an unincorporated area of Los Angeles County referred to as Palos Verdes Peninsula, California. This unincorporated area consists of two neighborhoods. One is called Academy Hill, with less than 200 homes, and the other is called Westfield, with approx. 300 homes. Many of the homes in The Palos Verdes Drive North area are zoned for horses and have larger lots. There is an extensive system of horse trails in this area as well as the adjacent city of Rolling Hills. There is also a small area just south of the intersection of Rolling Hills Road and Crenshaw Boulevard, adjacent to Torrance and surrounded on three sides by Rolling Hills Estates, that is also an unincorporated area of Los Angeles County, also within the mailing address of Palos Verdes Peninsula. This area has a large condominium and townhouse project called The Estates, which has some of the more affordable hoousing units on the Palos Verdes Peninsula. These unincorporated areas, although not a part of the four cities of the Palos Verdes Peninsula, are included in the boundaries of the Palos Verdes Unified School District. Palos Verdes Drive East : (Area in green in map above as part of area 165 just north of Area 167 in map above)This area of Rolling Hills Estates is south of Palos Verdes Drive north along Palos Verdes Drive East, and includes the neighborhoods of Hitching Post, Harbor Sight and Conestoga. Silver Spur: (Area in green in in map above Area 176 above). This area includes homes off of Silver Spur Road to the north of Hawthorne Boulevard until Montemalaga Drive, the borders of the City of Palos Verdes Estates on the north and west, and Hawthorne Blvd on the South.The homes in this area tend to be smaller and older than many of the other homes in Rancho Palos Verdes, and therefore tend to be more affordable. Neighborhoods include Grandview Estates. Peninsula High School is located in this area. Most of this area is located in the City of Rancho Palos Verdes except for Peninsula High School and some homes to the east of Silver Spur Road just before Montemalaga that are located in the City of Rolling Hills Estates. Crest: ( Area in green as part of Area 174 in map above) This area is in the center of the Palos Verdes Peninsula and is bordered by Hawthorne Blvd on the east, Indian Valley and Armaga Springs roads on the south, Indian Peak road and Crenshaw Blvd on the east, Crest road on the south, and the area to the east of Highridge Road (south of Highridge Park and Armaga Springs Road, and north of Crest Road). Most of this area is located in the City of Rancho Palos Verdes, but about 20% is located in the City of Rolling Hills Estates (including The Terraces project and the homes immediately on the east side of Highridge south of the Terraces project to Crest Road). Due to its location, most homes in this area do not have views. The homes in this area are primarily townhomes and condominium developments including the Terraces, Casas Verdes , and the Sea View Villas , Ridgegate, Mira Verde, Armaga Springs, and Hilltop Circle townhome developments, as well as a number of condominium buildings on Ravenspur Drive as well as condominiums on Peacock Ridge. La Cresta: (Area in green as part of Area 172 in map above) This residential area is surrounded by the City of Rancho Palos Verdes and is bounded by Hawthorne Boulevard, Indian Valley Road, Armaga Springs Road , Highridge Road, and Crest Road ( the Wallace Ranch development at the intersection of Armaga Springs Road nad Highridge Road is located in the City of Rancho Palos Verdes. Due to its location, most homes in this area do not have views.Several of the housing developments in this area are gated and private including Vantage Point, The Ranch, Rolling Hills Park Estates, Hillcrest Manor and Hillcrest Meadows, and include the townhome developments of Rolling Hills Park Villas , and Cresta Verde . Highridge Park is a large community park. 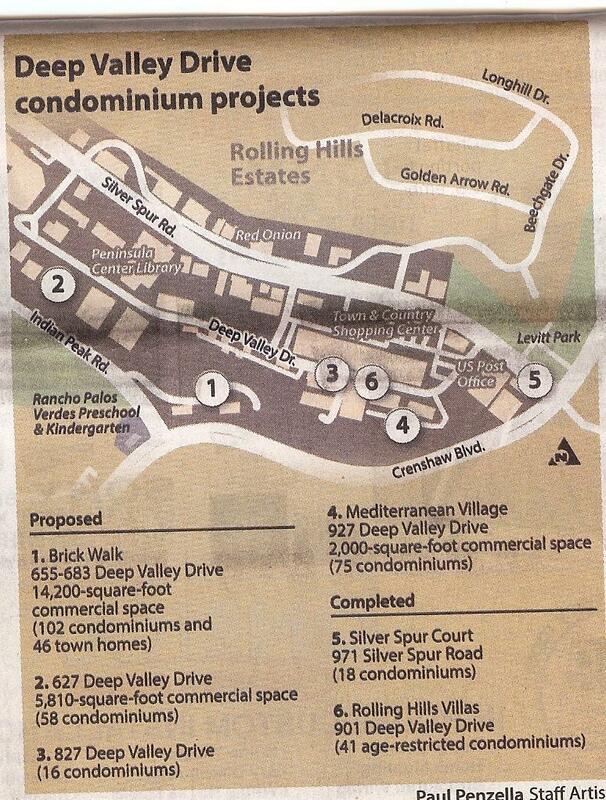 The City Council of Rolling Hills Estates on March 28, 2006 approved a new condominium complex to replace a previous car wash adjacent to the Avenue of the Peninsula shopping mall and across from the Public Library on Deep Valley Drive at 627 Deep Valley Drive. The project is now under construction and will be a four story 58 unit condominium, with units containing two or three bedrooms with two baths, and ranging in size from 866-1,374 square feet. The project will also have roof top decks as an additional amenity. The units will be clustered around a central courtyard and will also contain ground floor retail space. The proposed 655-683 Deep Valley Drive and 924-950 Indian Peak Road Mixed-Use Residential Project is also currently in the planning stages.The proposed project would demolish the existing office buildings at 655 Deep Valley Drive, 924 and 950 Indian Peak Road, surface parking lots, and landscaping. Construction of the proposed project would stabilize the existing landslide and include 148 residential units, approximately 14,200 square feet (sf) of commercial area fronting Deep Valley Drive, and associated parking. 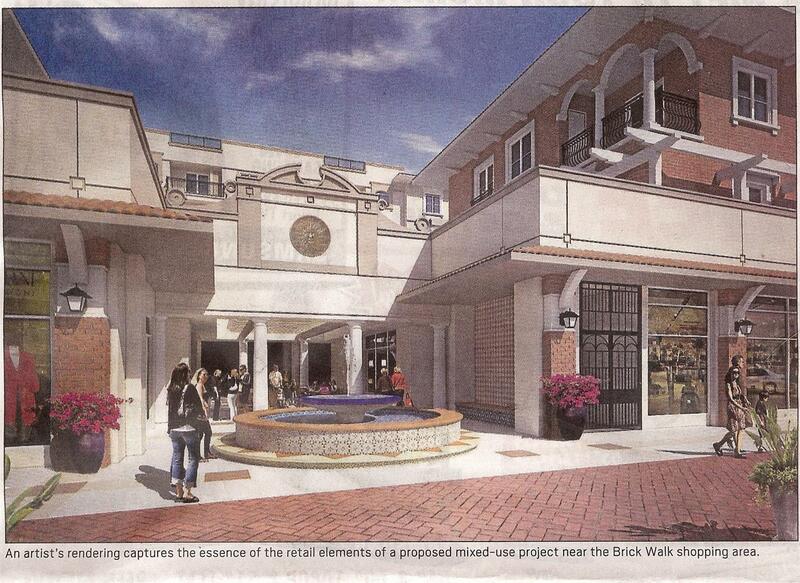 The Brick Walk commercial development would be enhanced through exterior facade improvements, including, but not limited to, new paint and replacement of awnings. Another project, which will be a mix of medical offices, condominiums and ground floor retail, is also in the planning stages, to be located at 927 Deep Valley Drive just west of the Post office on Deep Valley Drive, and adjacent to the Rolling Hills Villas.The project is planned for 75 condos and 2,000 sq. ft. of commercial space. Grading of the site has now begun. The project is consistent with the City's vision of an urban village along Deep Valley Drive mixing retail, office, and commercial uses in a pedestrian friendly environment. On March 7, 2007 the planning commission of the City of Rolling Hills Estates recommended that the city council approve Craig Knickerbockers mixed-use project proposal for a new 16 unit condominium complex in the city's downtown area at 827 Deep Valley Drive.. The units are planned to be one bedroom, one bathroom, and a den ranging from 1,150 to 1,250 square feet, and are planned to appeal to young buyers, or to empty nester retirees wanting to maintain a small residence on the Hill. The developer will renovate an existing medical office building while building the new condo residences. Students attend school at Palos Verdes Peninsula High School (located in Rolling Hills Estates) , Ridgecrest Intermediate School and Miraleste Intermediate School ( located in Rancho Palos Verdes), and several local elementary schools, all part of the Palos Verdes Unified School System. There is an additional high school located in Palos Verdes Estates, Palos Verdes High, and both high schools are California Distinquished Schools, with open enrollment to students on the Peninsula (they do not have enrollment boundaries). Palos Verdes HIgh has a unique class scheduling structure, called block scheduling, where students attend three extended periods each day, alternating with their other three classes each day. Peninsula High has a more traditional structure of the same periods for all classes each day. Palos Verdes Unified School District has some of the highest test scores in the state. There are also a number of excellent private schools on the Palos Verdes Peninsula. 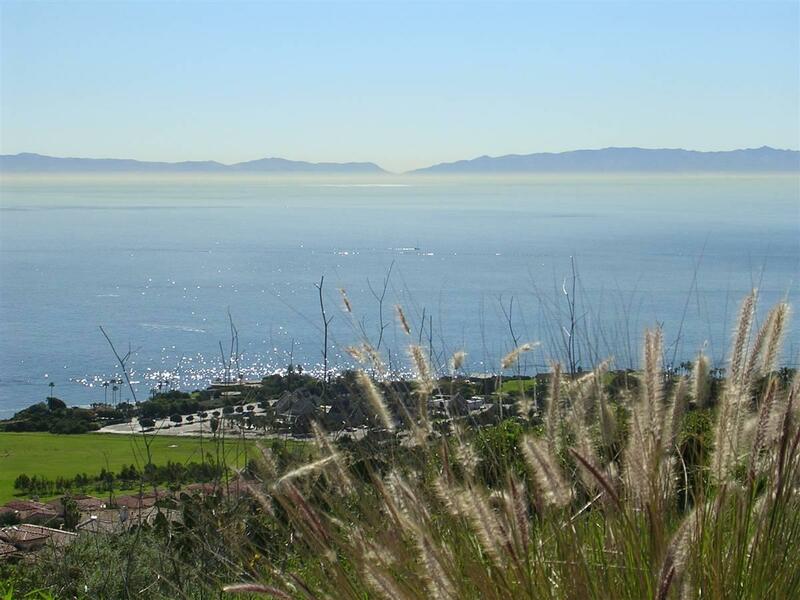 Most of the cultural activities for the Palos Verdes Peninsula are located in Rolling Hills Estates. These include the Norris Center for the Performing Arts, the Peninsula Symphony, and the PV Players. The Palos Verdes Art Center is located in the City of Rancho Palos Verdes. For further information on Arts and Culture on the Peninsula, Click Here. Children in Rolling Hills Estates play baseball in two little leagues ; Rolling Hills Little League (located in adjacent Rolling Hills), and Silver Spur Little Leage (located in Rolling Hills Estates), ( For a map of the little league boundaries, Click Here ) Pony League baseball for 13 to 15 year olds, is available at Ernie Howlett park in Rolling Hills Estates, and George Allen Field in Palos Verdes Estates. AYSO Soccer leagues are active throughout the City. Girls softball is generally played on fields at various school locations There are also youth basketball leagues, and lacrosse leagues for intermediate schools. Public Golf Facilities are available at Los Verdes Country Club and Trump National Golf Club in Rancho Palos Verdes, and the Palos Verdes Country Club (weekdays only). Los Verdes is a public golf course run by the County of Los Angeles. See Golf on the Palos Verdes Peninsula for detailed information on the Golf Courses on the Palos Verdes Peninsula. 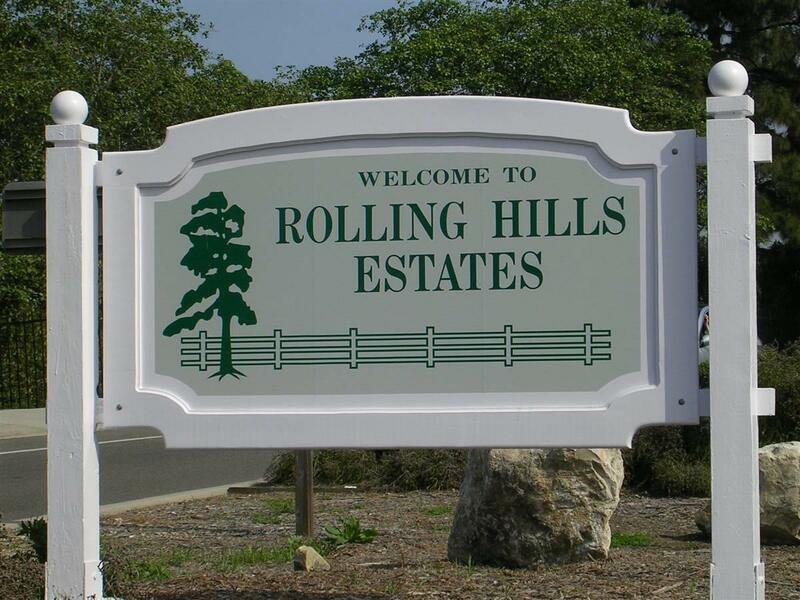 Rolling Hills Estates has several large parks including Ernie Howlett Park, Highridge park, and four other park facilities. Ernie Howlett Park is located at 25851 Hawthorne Boulevard between Palos Verdes Drive North and Rolling Hills Road, Ernie Howlett Park is the Citys major recreational facility.This 35 acre park provides facilities to many sporting and leisure activities, including: four one-wall handball courts, multi-purpose athletic fields, a regulation basketball court, a sand volleyball court, picnic tables, barbecue pits, and a variety of playground equipment. The park also boasts a 3/4-mile running track and a bicycle path. However, for many of the sports-mined, the main attractions of Howlett Park are the Rolling Hills Estates Tennis Club and the Equestrian Center. Eight tennis courts are open to the public, with a patio, refreshment center, and a grandstand for tournament spectators. The Equestrian Center at Ernie Howlett Park, which features three riding rings, a dressage area and grandstand, and multi-use trail, is a frequent site for local horse shows. Other equestrian facilities are located in the City at the Rolling Hills Estates Stables, the Empty Saddle Club, Chandler Park, and Dapplegray Park, as well as the Palos Verdes Stables in Palos Verdes Estates. Located at the corner of Crestridge and Highridge Roads, Highridge Park is a 10-1/2 acre facility that features two regulation-size soccer fields, youth softball/baseball field, barbecue pits, restrooms, picnic tables, playground equipment, approximately one mile of running track with Par Course stations, and a multi-use trail. The South Coast Botanical Gardens are located on a former landfill site on Crenshaw Boulevard. The Gardens include many unique garden environments, including a Japanese garden, a rose garden, a children's garden, and a water garden. Many events are held here including garden shows and concerts. For additional information on sports, parks and recreation opportunities on the Peninsula,Click Here. Property Taxes: The property tax rate for the fiscal year of 2017-2018 is 1.072583%(computed by the standard 1.0% of the property's assessed valuation (in accordance with Proposition 13, a property's assessed valuation is the original purchase price, plus the cost of improvements, based on the value of permits pulled, plus an increase in valuation of 2% per year) plus additional tax rates for voted bonded indebtedness) plus direct assessments of approx. $600-$700 per parcel for such items as school parcel taxes, etc. Property Transfer Tax: The County of Los Angeles levies a transfer tax upon the sale of a property of $1.10 per thousand dollars of the sale price. Police, Fire and Paramedic services are contracted with Los Angeles County with the Los Angeles Sheriff's Department, and the Los Angeles County Fire Department.